This small 58 page page booklet, illustrated with black and white drawings and diagrams, is pretty basic. The emphasis is on Anglias, with the goal of bringing that small Ford up to Cortina GT specs. There is a chapter on twin cam engines (chapter 8) but it contains nothing new to anyone with even a passing knowledge of the engine. 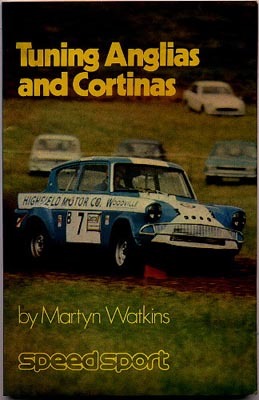 Parts of this book were published in 1967 as "Tuning Small Fords". Martyn Watkins revised that edition, adding a section concerning the V4 engine, and the previously mentioned twin cam chapter. First published in 1969 by Speedsport Motobooks, Bercourt House, York Road, Brentford, Middlesex, TW8 OQP, England, it is ISBN # 0-85113-003-8.